My, but doesn’t that Santa have a richly patterned hat, Barbara? Millie has been very helpful with my knitting lately. She is a very active cat and as it gets colder out, she goes out less and less. That leaves me to entertain her. She likes to walk over my keyboard until the sounds stop, then lie down to purr. She often grabs at the yarn as it comes out of the ball. 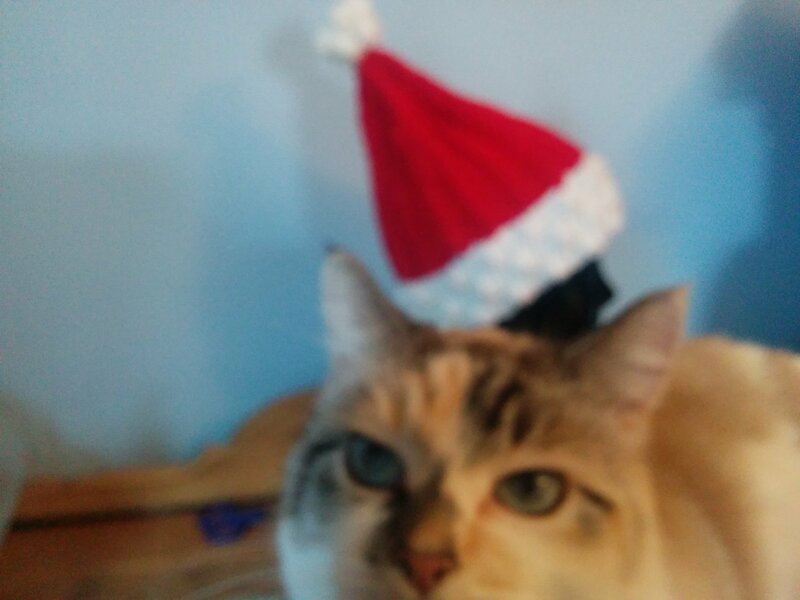 Today she decided to help me with my photography. We had a great day yesterday at Hilary’s place. 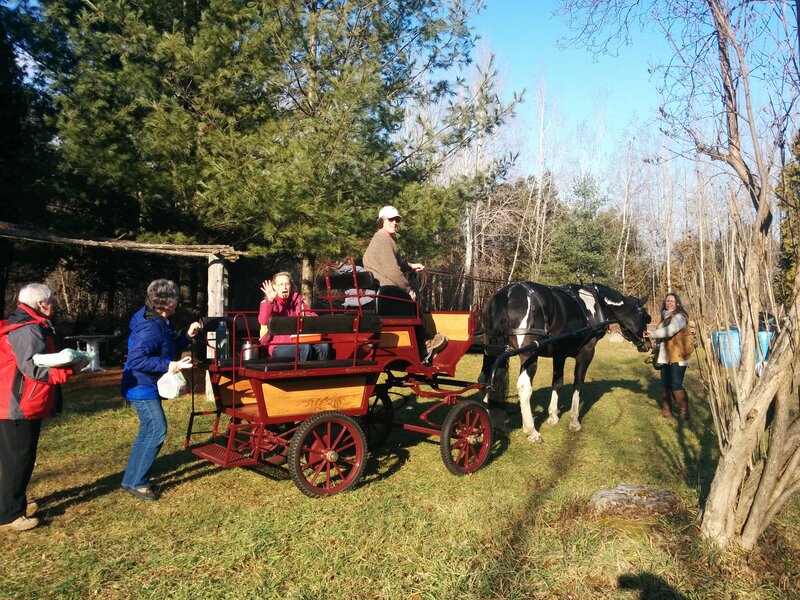 Hilary is one of the horse drivers at the village and yesterday she hosted the monthly get together of the Ladies’ Benevolent Society, which is what the women of the village call ourselves these days when we gather in the off season. We used be called Heritage Hands and meet to learn historic crafts, but nowadays it has mostly devolved into a potluck and gabfest kind of deal. Equally enjoyable if a tad less educational, and with a whole lot less prep work. Hilary owns her own horse and wagon. You can also see Marjorie, Janice and Mary who Hilary had just brought down the lane. It was 11 degrees (C) and beautiful for the 9th of December. Her attempt to host the same gathering at this time last year apparently happened in a blizzard. I myself was on my way to Bhutan. I saw the Puff Stitch, pg150 and thought it would give a nice bulky appearance instead of fur for the bottom of Santa’s hat. Barbara told me it had plenty of horizontal elastity so I only cast on 96 stitches. I increased to 120 sts for the Wheat Ear Cable and Reverse Wheat Ear Cable, pg 244. To get rid of the stitches, I reduced the cables from 3 x 3 to 2 x 2, then 1 x 1. 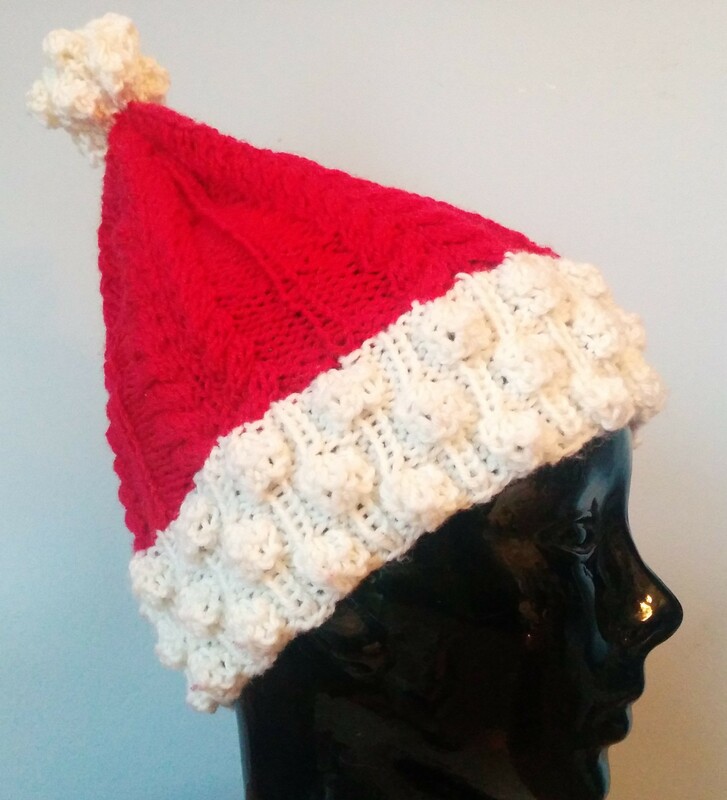 I spread this out over 8 pattern repeats so that the top was elongated for Santa, then put a bobble made of Puff Stitch on the top. I made enough aborted runs at the top of the hat that I put in a lifeline to rip back to, but I think it ended up ok finally. 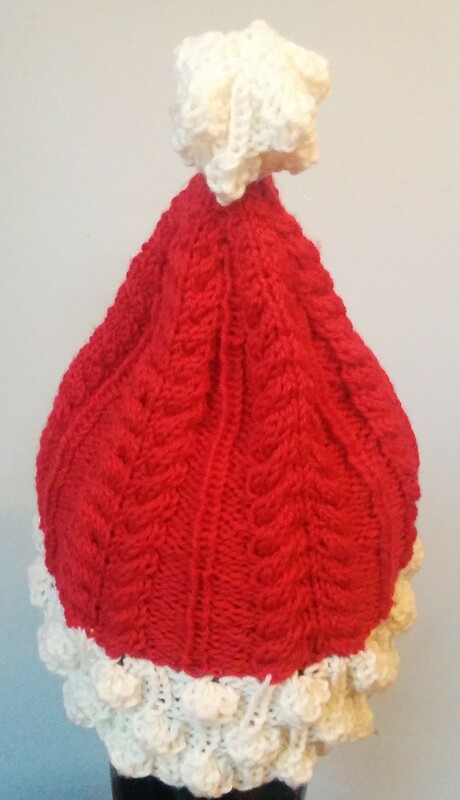 This entry was posted in Barbara Walker and tagged A Treasury of Knitting Patterns, Barbara Walker, Cascade 220, Christmas hat, knitted hat, santa hat on December 11, 2015 by gillianknitter.